As a long-time resident of Bath I have met and photographed Miles Kington on several occasions. 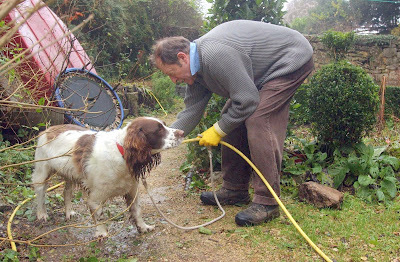 The first time I went to his home in Limpley Stoke with a reporter, Miles had just come back from walking his dog, and said “I must wash the dog before I do anything” I followed him into the garden and was rewarded with this picture of Miles Washing his dog. The second time was when Caroline was being sworn in as a magistrate, he stood in the background refusing to be in a picture. The last time we met he was backing into a space behind my car and gently touched it, I jumped out and said” Don’t they teach you to drive at the BL**DY Independent” he thought I was serious and started explaining that he was a freelance. Then he realised he knew me and I was winding him up. Mile was a very talented writer, journalist and human being he will be sadly missed by all who knew him. 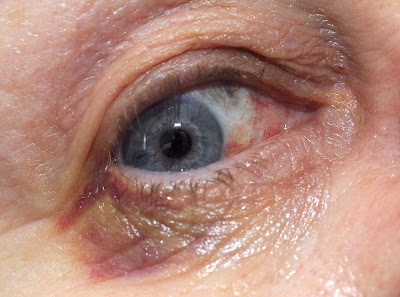 Wendy had a cataract and implant operation yesterday at Bristol Eye Hospital. 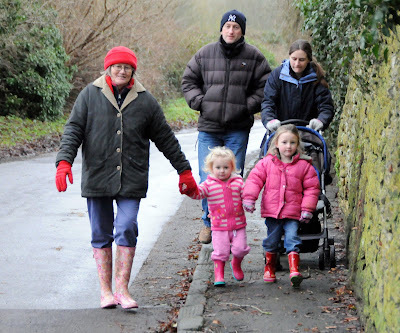 But is feeling well and can see an improvement in her vision already. She has to take it easy for the next few weeks, no bending, sweeping, cleaning or cooking. I guess that puts a stop to her bungee jumping, hang-gliding and freefall parachuting for a while. Guess who’s doing everything apart from the bungee jumping, hang-gliding and freefall parachuting for her! 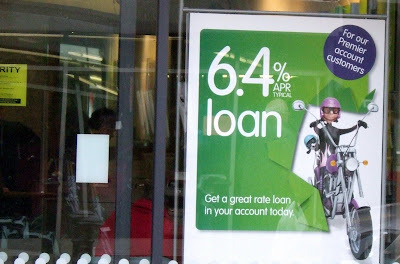 You may have noticed over the years, that if you have money the banks want to lend you more. But if you’re a bit short of a bit of ready cash they don’t want to know. 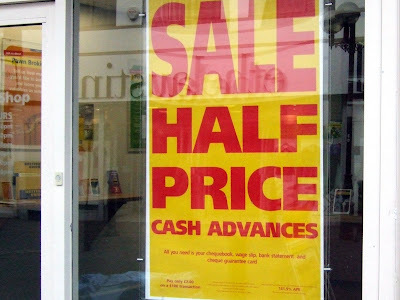 But if you need to go to a cheque cashing firm for a £100 cash advance for a month the Half-Price offer is 141.9% APR. 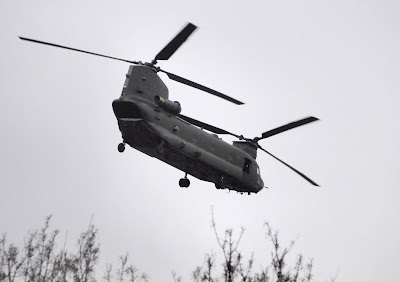 Most nights a number of Chinooks fly low over our house in a village to the South of Bath, the number varies between one and three. Sometimes one appears to have no lights, I wondered if the use the valley to help navigate, but that seems unlikely in these days of satellite navigation. They usually come back in an hour or so, tonight they were early with just enough light for a 3200asa picture. Today’s news from Nicky and Andy in France. Nicky has been doing a lot of this today. Note the riot stick thing. 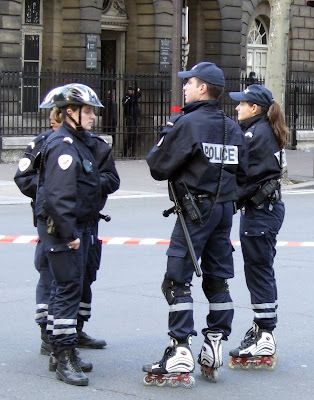 Apparently the roller brigade was created during the 1998 World Cup, when eight policemen were sent gliding down the Champs-lys es as part of a parade. 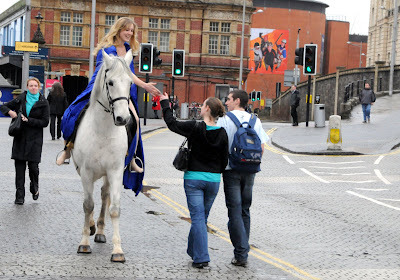 They were later given the job of escorting the growing throng of in-line skaters that have been touring the city every Friday night since a 1997 transport strike. On the way back from Bristol Eye Hospital with Wendy I went to post an urgent letter, in a little Tesco Post Office just outside Bristol. The queue had about seven people in so I decided to wait rather than drive back into Bath and park. 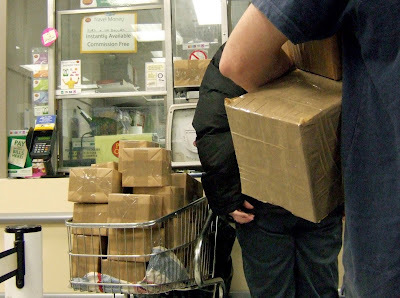 It took nearly 45 minutes to get to the counter, it turns out that Monday is eBay day and everybody had dozens of little parcels to post. The Lady at the front of the queue had a shopping trolley of parcels and was saying this is for America and this is for Ireland and this is for Italy. 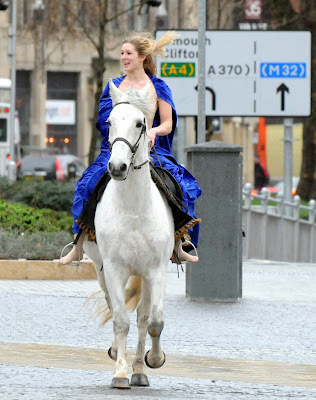 A young lady was promoting the new film “Godiva” riding around Bristol City Centre today. Unfortunately she didn’t do it properly, wearing bra pants and a body stocking. But with the heavy rain and cold wind, I wouldn’t have blamed her for wearing a Barber Jacket! 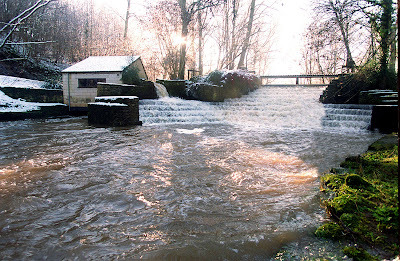 The recent heavy rain has caused problems with our water feature. The water may come over the river bank tonight! Fortunately our bungalow is about 50 feet above this level. It’s always been said that the mound in the centre of the area originally planned for Hinkley Point C Power Station site was used to dump all the waste from the building of the original station. In 1957 environmental disposal laws were unthought-of, so the much of the left over building materials were just dumped and grassed over, it is rumoured that if the new station is built there they will excavate the bones of a circa 1957 JCB. 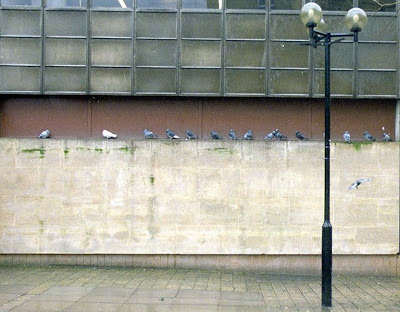 I wonder where they shelter now! Galleries Bristol caught my eye today. 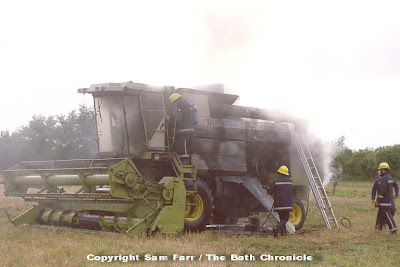 This must be one of the most unusual fires I attended in the last 20 years working for the Bath Chronicle. The Fire-control room told me the fire was at Combe Hay Lane, but I ended up driving across an old plough field to get to it!